The worst sound I’ve ever heard is the absence of her heartbeat. I happened to have a stethoscope on the couch in the room I tried to revive her in. I rabidly and aggressively listened begging for the sound I had always heard when caring for other people’s children. It was to be no more. For a time. God answered my prayer but not in the way I hoped. For part of Ellis’ s heart did beat again – – giving life to other families begging God for the same beautiful cadence of their child’s heartbeat to continue. We are the proud parents of an Organ donor. 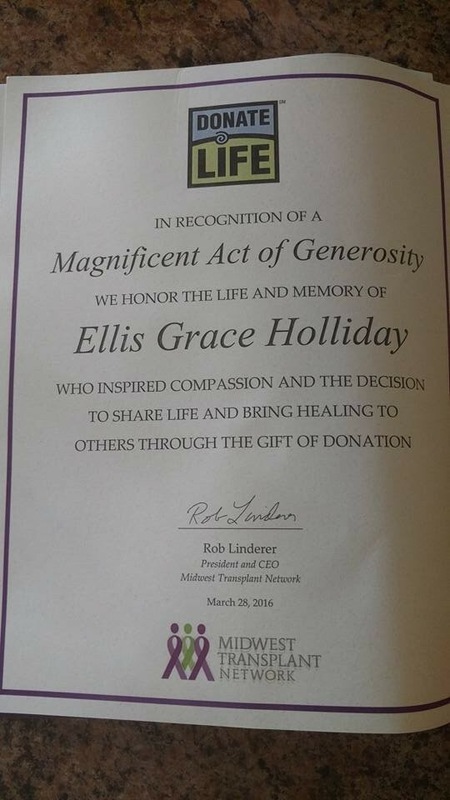 We know that Gods purpose for Ellis was so much greater than this single gift of her earthly life. But because we believe that God answers all prayers with the right answer – as He sees all and knows all, we can rejoice that His loving “no” to our deepest cries was perfectly weaved into a beautiful “Yes” to the cries of two other families. We rejoice with them and trust that their faith has been made stronger because she lived and because He Lives Still. . . we couldn’t share a more beautiful heart than that of our sweetly delightful Ellis Grace. Please consider organ donation as a blessing to your family. We know God can heal and restore any way He chooses but how wondrous that this is one of those ways. Therefore glorify God in your body, and in your spirit, which are Gods. . .